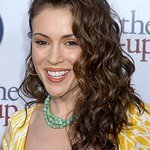 The Drop in the Bucket ‘Cause on the Rocks’ fundraiser presented by Causecast was hosted by esteemed actress, designer and philanthropist Alyssa Milano at the Viceroy Santa Monica on Tuesday, October 19. The evening raised funds and awareness for Drop in the Bucket’s work improving the health and safety of children in Africa by bringing clean water wells and specially designed Eco-sanitation systems to African schools, particularly those regions such as northern Uganda and Southern Sudan. Milano was introduced by Drop in the Bucket supporter Henry Rollins, who expressed his own admiration and support for the work of the organization. Benson Deng, co-author and subject of the book, “They Poured Fire On Us From The Sky: The True Story of Three Lost Boys from Sudan,” was the guest speaker of the evening, relating his experience as a former child refugee from Sudan to the region’s current need for fresh water. Organization co-founder John Travis ended the presentation by detailing Drop in the Bucket’s progression in four years from the first volunteer meetings around a kitchen table in Los Angeles, to the full-time operations they have established in Africa, including offices in Gulu, Uganda. DJ Native Wayne from KROQ and INDIE 103.1 FM provided music for the evening while guests filled out bid sheets for silent auction items such as an original print from famed civil rights photographer Ernest Withers, a signed Quincy Jones limited edition embellished giclee and handmade African jewelry, fabric wristlets and bags. Among the guests joining Milano, Rollins and Deng to support the organization were Rock ‘N’ Roll Hall of Fame Member and Grammy Lifetime Achievement Award Winner Booker T. Jones; actor Ade M’cormack (Blood Diamond); musicians Gerald Casale (Devo) and Ken Jordan (The Crystal Method); and actresses Jill-Michele Melean, (Mad TV), Lee Meriwether (All My Children), Shelby Young (The Social Network), Kate Linder (Young and the Restless) and Heather Tom (The Bold and the Beautiful). Photos taken of African children enjoying newly installed wells covered the walls of the event and throw pillows created by event organizer Marketing A Cause were imprinted with water facts to remind guests of the crucial impact of the funds raised during the evening. Additionally, 100% of the proceeds from the Voli Vodka-created drink ‘Splash of Life’ being sold for $10 during the evening—and throughout the month of October—at Viceroy Santa Monica also benefited Drop in the Bucket.